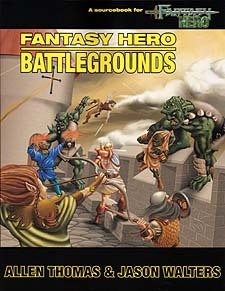 Fantasy Hero Battlegrounds also features eight more locations suitable for any campaign: an abbey; a manor house; an ifrit's bottle; a tavern; an alchemist's shop; a prison; a farmhouse; and a wizard's tower. Each location comes with detailed maps, NPCs, and plot seeds. No matter how powerful your heroes, Fantasy Hero Battlegrounds has adventures they'll enjoy! Uses monsters from The HERO System Bestiary and Monsters, Minions, and Marauders.